This guide to Jack Russell behaviour aims to explain in a quick and simple way all the most common behaviours seen in a Jack Russell Terrier - and what causes them. At the end of this page, I'll give you a link to the resource that explains in detail how to solve all of these problems with methods specific to Jack Russells. What's Your Jack Russell Behaviour Problem? This is one very common Jack Russell behaviour problem that JRT owners find in their dogs. Jack Russells dig because it's one of their natural hunting instincts. The Jack Russell's job as a hunting dog involved digging for foxes, badgers or rabbits when these animals went down into their underground lairs. This instinct is still strong in most modern Jack Russell pets and it needs to be given an outlet if you want to keep the behavior under control. Jump to the end of the page to learn how to solve the digging problem. This is probably the biggest complaint I hear from JRT owners. In my ebook I identify three main causes of aggression in JRTs: fear, frustration and dominance. Make sure you understand which form of aggression you're dealing with, because it can often be hard to tell the difference if you don't know what to look for. The different types of aggression need to be treated in different ways - if you try to treat a dog as if it is being dominant, when in fact it is actually being aggressive out of fear, you are probably going to make the problem worse. Jump to the end of the page for a resource that explains the forms of aggression and how to treat them. Another common complaint, and like the digging problem, barking is a built-in Jack Russell terrier behavior. Once the Jack Russell had dug down into the hole of that fox, badger or rabbit, it was their job to - you guessed it - bark loudly so that the hunter could locate them while they were out of sight, underground. 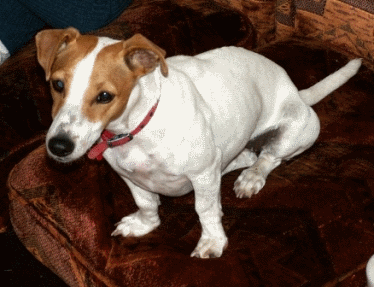 Jump to the end of the page to learn how to deal with excessive Jack Russell barking. Running away is most common in Jack Russells that aren't spayed or neutered. They pick up the scent of possible mates in the neighbourhood, and their mating instincts kick in - so they break out and go wandering. Neutering helps a great deal in solving this behaviour. This is a relatively minor but still quite annoying Jack Russell Terrier behavior. Because Jack Russells are small dogs, full of energy and very affectionate toward their owners, they tend to get excited when someone comes home and jump up all over people. There's a simple command that can be taught to help stop this problem called the "Off" command. See the bottom of the page to learn more. Chewing is something that is more prevalent in the puppy stages, but most Jack Russells continue to be big chewers when they grow up. The best solution is to make sure you provide plenty of things that your dog is allowed to chew on, such as toys and chewy food products. Learn more about the various types of chews suitable for Jack Russells and advice for stopping real problem chewers. This is a Jack Russell behaviour which has no cure - but that doesn't mean there's nothing you can do about it. Plenty of exercise is a must for Jack Russells - again, because of their history as hunters they were bred to have a lot of stamina. Take your dog for one or two long walks every day to help expend some of that energy. There are also some time-saving methods you can use to burn up that energy without having to spend too much time on walks - learn more. As natural born hunters, JRTs love to chase "critters" like mice, rats, squirrels, rabbits - and yes, often cats. To stop this from happening can be very difficult once it starts - the animals have to be socialized and introduced very slowly, a little at a time. It's better to socialize the animals together as early as possible, preferably while the dog is still a puppy. 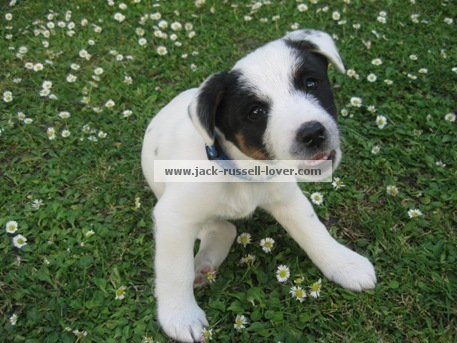 Find out more about puppy socialization and living with a JRT and other pets. This Jack Russell behaviour problem is often associated with aggression, and usually it's an indication that the dog is either afraid people around him will take his things away, or he sees himself as the "alpha" dog and the rest of the family as lower members of the pack. In either case, the pack hierarchy of the household is out of line - and the basis for making it right is a solid obedience program. This can be anything from a new puppy having trouble learning to go outside, through to an older dog start to "forget" her toilet training. Like aggression, toilet training problems can have different causes, and the solution you need to apply depends on what the cause is. If you have a puppy, a regular routine and plenty of trips outside after meals and drinks, as well as before and after bed, should be enough to fix the problem. In older dogs it can be a sign of disease or stress caused by a change in environment. Read on to learn about a resource that explains all the different types of Jack Russell housetraining problems and how to fix them. My ebook is the most comprehensive Jack-Russell-specific training guide on the Net. 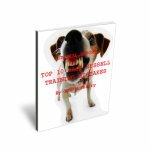 It covers multiple solutions to all the Jack Russell behaviour problems explained here, as well as an extensive basic obedience training program that will improve your Jack Russell's behavior faster than you thought possible. The ebook explains how to become a leader in your dog's eyes so that he or she will look to you for guidance and obey your commands. Just take a look at some of the testimonials from other owners who have read and used the skills they learned from The Jack Russell Lover's Ultimate Guide To Training.